Let’s go back a step – that’s our bedroom… Yup deep, dark green – our house is full of color – where we have two double futons on the floor and most of us sleep there – the big kids have their own beds, that you will come to on the tour. Yes the bedroom is a deep, dark green and I totally love the color – it is like sleeping in a cave and no we never have little people waking up at the crack of dawn because the sun rises on the other side of the house anyway, and they are none the wiser that the day has begun!!! In the one corner our bedroom we have our memory shelf. And yes that is my only dress hanging there. And yes it is my wedding dress!!! With all the soft toys on the bottom shelf – I do not sleep with a menagerie. 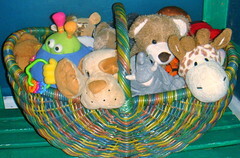 Toys sleep in a basket – thank-you very much!!! 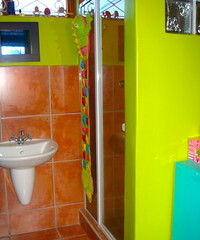 Behind the door we put up a towel rail to hang all those little girl dresses and that’s about it. 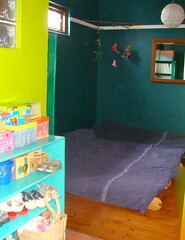 A bedroom is for sleeping and so doesn’t have much else in it. I am a firm believer in storing like things together, regardless of ownership and prestige. It is so much easier to have everyone go to the same spot to gather their goods – hence a fairly large dressing room for everyone. 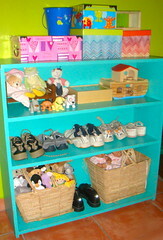 First the shoe shelf, and treasure boxes for those kids who haven’t got their own beds for storing their treasures. 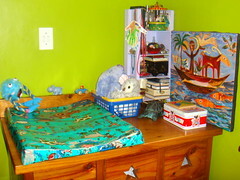 This is “my desk” where I have spent many hours changing diapers (nappies) and engaging tiny people in conversation. 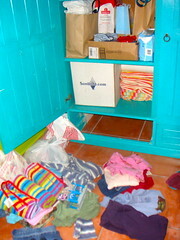 Below it are some drawers – I keep everybody’s clothes in three drawers: bottom drawer for shorts and trousers; middle drawer for shirts and tops; and finally the top draw for undies and pajamas. But that is the laundry story. 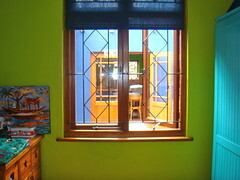 There is the view out into the inside/outside room and our kitchen beyond. To the side of the window is our great big closet and every house needs one. This is a before photo from last week. 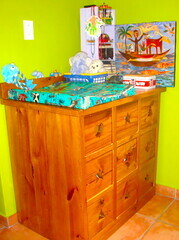 And all the goodies that I rolled out of it, that didn’t actually belong there including a matchbox carwash!!! And here it is this week sorted (Just the bottom half there is no need for you to see all our clothes, trust me they are neat for now). The gift bags are pending clothes waiting to be past down the line, I only keep what I absolutely love and donate the rest. The nasturtium bag is full of sewing projects… that I have to get to!!! Otherwise there is a box for all our bags and a box for everybody’s backpacks. The two big white boxes are for household goods that are in limbo: One box is where I pop things to donate and when it is full I deliver them to the shelter up the road and the other box is for pending items – waiting to hear if they are requested or forgotten. 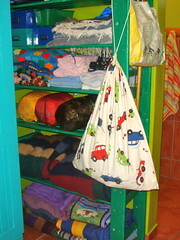 Finally next to the closet is our blanket shelf – where I obviously keep blankets, including the ones collected from our travels. When we visit a new country we always buy a blanket and yes I have had the father person carry a huge thick woolen blanket through the heat of mid-summer Greece!!! Behind the dressing room is a shower room with a shower big enough for se7en + 1. That’s it – Our Dressing Room. I will do another room next time. Amazing! 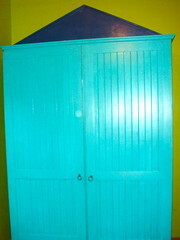 That chest of drawers and closet are where you keep the clothing of all nine people in your home? I have been reading over the last few months about “family closets”, but most of these are an entire room packed from floor to ceiling with clothing storage. Of course, those have all been American families. Maybe we Americans think we need more clothes than we really do? Hi Sleepy Knitter. No, each kid gets three drawers… the big kids three drawers are with their beds. So those drawers are for two boys and two girls – the girls are pretty interchangeable (same size clothes still) so they share their three drawers. #8 has hardly any clothes – being a person of very short stature and his clothes are in the flat box you can see in the finished-closet photo. Everybody has a pair of jeans, a pair of track pants and two pairs of shorts; two or three t-shirts, one or two sweatshirts and a sweater. We live in a part of the world where poverty is rampant and visible on every side, so I can’t really justify owning more stuff. Also we never waste any time decision making on what to wear, the decision is made!!!! How’s that for a super detailed response!!! Hope you have a great week!!! Doesn’t surprise me that your house is this CHEERFUL and COLORFUL!!! 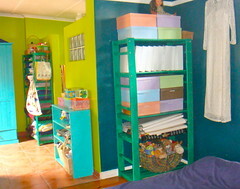 Hi K-M, I hate to say it but colorful it is – every room has its own color!!! You will just have to wait an see the other rooms!!! Hope you guys have a great week!!! Thank you for the detailed response! Having lived in a variety of areas around the world, I do understand what you’re saying about living amidst poverty. / Recently I read a blog by an American mother of nine (I think) (Raising Olives?) in which she mentions limiting the number and type of clothing each child in the family can have, in order to spend less time managing clothing. After reading the blog, I tried that for myself, setting a numerical limit ahead of closet-cleaning time and then following the limit ruthlessly, and wound up giving away about half my clothing to charity. Much less to manage! Well worth the effort. Hoping not to sound stupid but where do you and your husband keep your clothes? Hi SleepyKnitter, I absolutely find the less we have the less we have to maintain and the fewer decisions to be made – everyone is happier for it!!! Have a good day! Hi S, Aaah the curiosity of the blog follower!!! 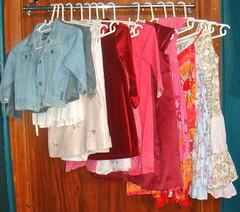 The top shelves of the huge closet in our dressing room are devoted to our clothes… Have a good day! Love the little sneak peaks into your happy home. I’m in the midst of changing over to winter clothes and I’m constantly amazed by all the clothes that arrive. We hardly buy any, but are blessed with lovely handme downs. Hi JK, GLad you like our home!!! I love peaks into other peoples homes – love love love them!!! And Praise the Lord for Hand Me Downs… I don’t think we could ever cloth our kids without them!!! Providentially every time we desperately need clothes for someone and a Hand Me Down arrives to “stop the gap”… Hope you have a fabulous week over there!! !